Who assassinates , steals food in southern Yemen? This file photo shows suspected al-Qaeda militants in an undisclosed location in Yemen. 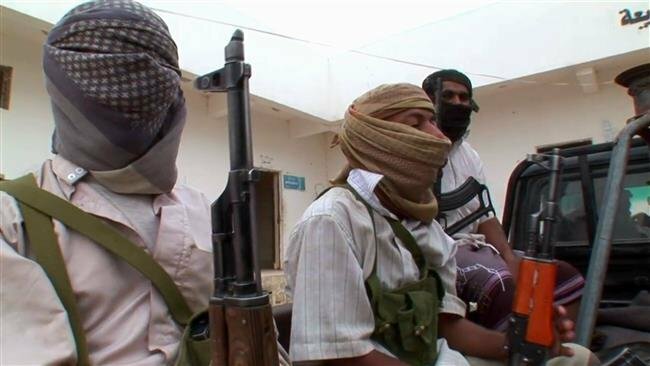 The city of al-Mahfad in Abyan province, southern Yemen, has reportedly fallen to the al-Qaeda terrorist organization, without any resistance from the UAE forces’s so-called Security Belt forces, only three days after the terrorist organization deployed its fighters in the city late on Tuesday. The commander of the UAE-backed paid fighters, Mounir Yafia’ae, and the commander of the UAE’s First Support Brigade, survived an assassination operation in Mahfad city on Tuesday, as three of his escorts were injured in an armed attack. At least 17 members of UAE-backed paid fighters were killed and wounded in bombing targeted a popular market , whereas the terrorist bombing attack targeted a rally of the UAE-backed security belt forces in the Souk city centre of al-Mahfad, killing two and 15 wounded as an initial toll.Earlier, several terrorist operations were carried out against the security belt forces in Al-Mahfad district. A number of organizations complained last week of food theft in southern areas and some areas in northern Yemen. A number of displaced people from Hodeidah and Taiz provinces, who are in the camps in Zanjabar city complained of not spending them the monthly food and relief aid planned by CARE International.The IDPs suffer from very difficult living conditions due to the lack of food. They said that their suffering in the camps increased due to the delayed disbursement of their food allocations, although they have been in the warehouses in Zanjabar City for 20 days.The IDPs called on Care International organization to quickly disburse the relief aid they deserve. Yemeni forces strike their enemy over this!